Russ Lossing began his classical piano training at age six. He was composing, improvising and playing jazz by his early teens. 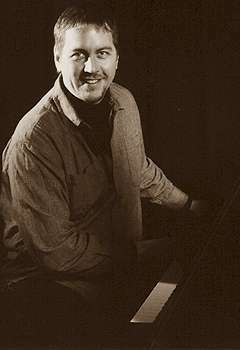 Since moving to New York in 1986, Lossing has composed over 200 jazz and classical works. He has been commissioned for chamber and solo chamber works and songs, and has an international reputation as a world class improviser. Lossing is featured on over 20 CDs, performing with acclaimed musicians Dave Liebman, Paul Motian, Mark Dresser, Bob Moses, Bobby Previte, Tom Rainey, Mat Maneri, Billy Drewes, and Mike Formanek, to name a few. He has composed 13 film scores: avant-garde shorts, feature length documentaries for PBS, BBC and world broadcast performances, as well as full-length dramatic features both foreign and domestic. He has done numerous television and live radio performances in Europe and the US. Russ tours extensively throughout the world, playing jazz clubs and venues and classical concert halls in Europe, Canada and the US. He has been a figure in some of the world's leading jazz festivals including San Francisco Jazz Festival, North Sea Jazz Festival (Europe), American Airlines International Music Festival (Canada), and The Bell Atlantic Jazz Festival (NYC). Lossing has appeared in concert venues such as Town Hall (NYC), Merkin Hall (NYC), Wiener Konzerthaus (Vienna), Ford Center for the Performing Arts (Toronto), National Theatre (Bratislava), and the great jazz clubs Blue Note, Birdland, Knitting Factory, Visiones, Tonic, Porgy and Bess (Vienna), A-Train (Berlin), Ermitage (Austria), and Bimhaus (Amsterdam). Evolving constantly out of an ever-inquisitive mind, Russ continually seeks out new projects within which he can explore his creative vision, as both leader and collaborator.